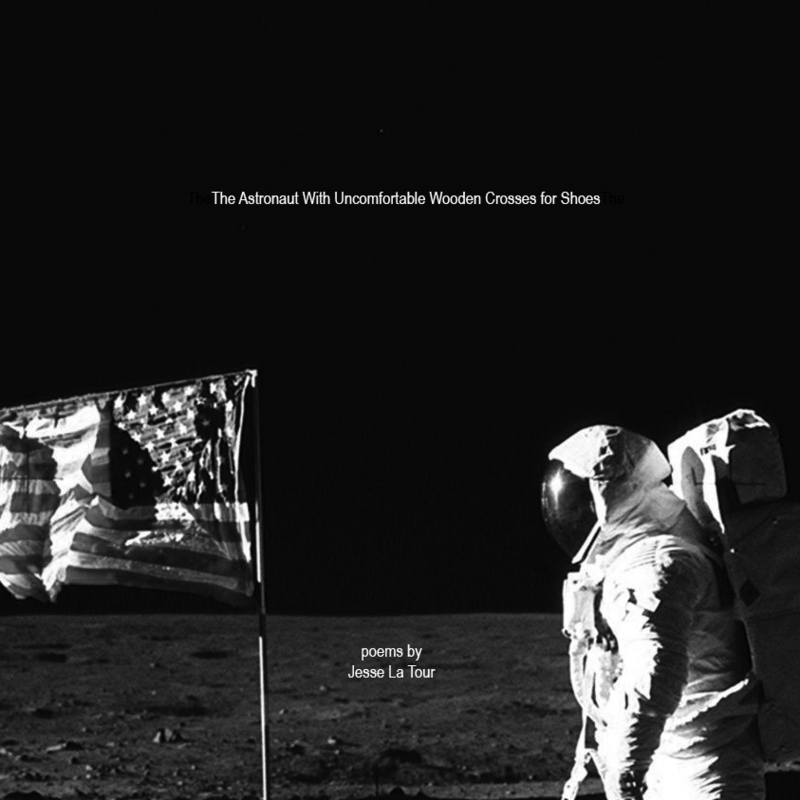 You are invited to a special poetry zine party at Bookmachine books + zines, featuring the release of Jesse La Tour's second collection of poems entitled "The Astronaut With Uncomofortable Wooden Crosses for Shoes." This event will feature live poetry reading and zines for sale! It all happens on Friday, January 6th from 6-10pm during the Downtown Fullerton Art Walk. As always, this event is FREE and open to the public. Rarely do I sit down just to write a poem. For me, the inspiration strikes randomly—waiting for the bus, riding a train, walking to work, or just wandering around my hometown of Fullerton, California. I don’t own a car, so I spend a good amount of time walking. This slower pace of travel, by foot, allows me time to mull over things I’m reading, conversations I’ve had, films I’ve seen, new music I’ve found, problems in my life, my community, America, the world. Traveling on foot, I tend to notice things people might miss in their cars—homeless people, weird industrial landscapes, trash, bugs, plants, the weather, etc. When I was a younger man, I wrote in my journals obsessively. Writing was a form of therapy. It still is, but lately it comes out as poems (that often read like journal entries). At the heart of most of these poems is usually some inner conflict I’m working out. I grew up religious and now consider myself agnostic, but religious themes still percolate into my writing—questions of meaning, morality, justice, purpose. Being an agnostic—that is, admitting that I don’t know whether or not there’s a God or a larger meaning to life—I’m constantly in a state of existential limbo between purpose and purposelessness. When I was younger, this uncertainty was painful. The older I get, the more okay I am with it—the not knowing keeps me always searching, reading, and writing. The unknowing, the existential limbo, is often the spark of poetic inspiration. The title of this, my second collection of poetry, comes from a real dream I had that sort of illustrates the overarching theme of many of these poems. In the dream, I am an astronaut who (for mysterious reasons) wears uncomfortable wooden crosses for shoes. I am, at the same time, a man of science and a religious ascetic. In real life, I am somewhere between these two poles—a lover of learning who is still haunted by questions that can only be described as religious.